Brown Paper Packages: Happy Hallowbirthmasgiving Day! I owe some friends gifts for. . . oh, let's see. . . every holiday since last January! I decided to make the packaging from my stash, instead of spending ridiculous amounts of money on wrapping paper and bows, etc. I really like how they turned out-- and how fast and simple they were! Yay. And my first time making cards with fabric and paper-- wow! That was fun and a little addicting. Another good use for scraps. 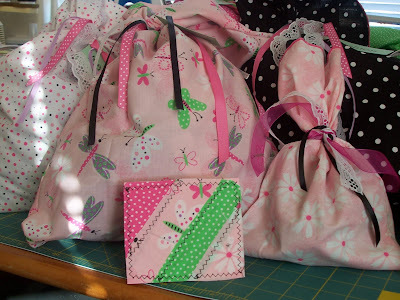 . .
What a great idea...and if the receiver is a quilter or crafter...more goodies to play with!